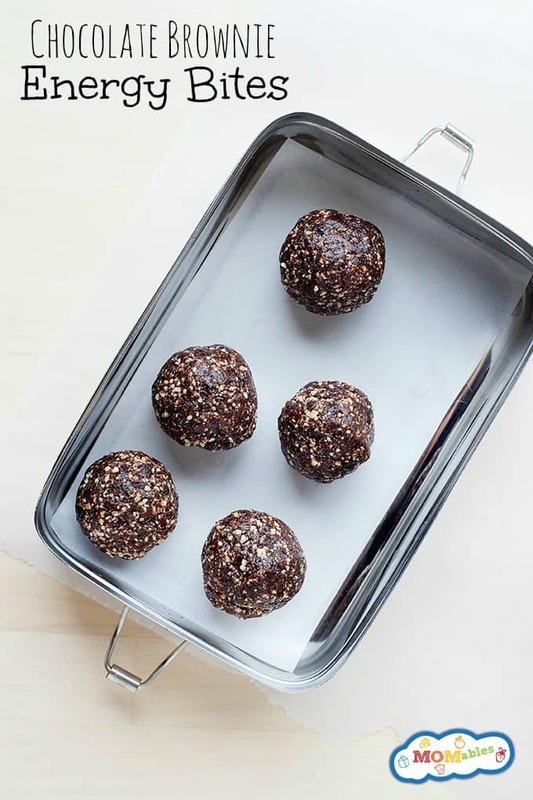 Chocolate Brownie No-Bake Energy Bites - MOMables® - Good Food. Plan on it! Chocolate Brownie No-Bake Energy Bites - MOMables® - Good Food. Plan on it! Need a healthy afternoon pick-me-up? These Chocolate Brownie N0-Bake Energy Bites are perfect for your kids’ after-school snack time or as a sweet treat for lunch. It’s like clockwork: around 3 or 4 o’clock every day, my kids start rummaging through the pantry and fridge looking for a snack. And even if I’ve eaten a filling lunch, I usually start to crave a sweet snack in the afternoon, too. I don’t like to eat something heavy to ruin my dinner, though. Enter these Brownie Energy Bites from The Best Homemade Kids’ Snacks on the Planet! Take a look at how easy these are to make. My kids absolutely love these. I love that they only take a few minutes to make, and I can make a big batch at the beginning of the week so we have snacks ready! It really is all about planning. If you don’t have something healthier to grab, you’ll be more likely to grab the bag of chips or something at the drive-thru. Of course, we like to treat ourselves every now and then, but on a day to day basis, I like to have healthier options ready for little fingers to grab. These are super simple to make, requiring just a handful of nutritious ingredients. They’re refined sugar-free and grain-free – if you’re allergic to nuts, you can try replacing the cashews with sunflower seeds. While these are perfect for snack time, you can even pack a couple of these in your kids’ lunch boxes as a sweet treat. Looking for other easy, healthy recipes kids will love? I developed a comprehensive 30-day program which helps families eliminate processed foods and eat whole, nutrient dense meals together. As a busy mom of 3, it was important to me that the program be easy to use, and picky eater-approved. After trying other 30 and 21 day programs that didn’t quite work for my whole family, I decided to build my own. My family KickStart program includes everything you’ll need to succeed. 30-days of meal plans, easy, kid-approved recipes, and simple swaps for your family’s favorite meals and snacks. If you have been searching for a way to eat better and feel better with your whole family this can be the solution you’ve been hoping for. Get started with a free trial of the Family KickStart Program here. After grabbing your trial, go ahead and print this recipe for a healthy snack your family can enjoy together today. Everyone will love these delicious brownie energy bites, because who doesn’t love chocolate? This recipe is from my cookbook The Best Homemade Kids’ Snacks on the Planet. Place raisins in a medium bowl and cover with hot water. Let soak for 5 minutes to soften then drain. Add raisins and all remaining ingredients into a food processor and pulse until mixture turns into the consistency of sand. Remove blade from the unit. Using your hands, scoop out dough and form into balls on the palms of your hands. Chill for 30 minutes and enjoy. Store in an airtight container in the fridge for one week. Love!!!! I was just looking for something different to do for snacks for the kiddos. Made this but used dates instead of the raisins and it worked just the same. It tastes delicious! Made these with sliced almonds, and they were fabulous! Also, added unsweetened shredded coconut. Great healthier snack. I”m so glad you liked them Crystal! I’m glad you figured it out! And yes, Mindy, that is beyond sad – kids can definitely be mean when it comes to something different than what they know. At least you know she’s eating healthy! I found these really tough to roll. The pieces would bream up as soon as I applied any pressure. I used almonds, so maybe they need to be broken into smaller pieces first. You may need to process them a little longer, or add some more raisins to give them moisture. You can also try adding 1-2 tablespoons of water to get them to stick better! Dates or prunes would definitely work here! If you don’t have a food processor will a blender work? Yes! Just make sure to watch it to get the right texture. Cocoa powder? Do you mean the unsweetened kind u bake with, or something else? Yes! Just plain unsweetened cocoa powder. My son is allergic to ALL nuts…. Can you suggest a no -nut substitution for the cashews? Thanks!! Hey Charlene! Sunflower seeds could definitely work here. Perfect! I was thinking of those as well! I can’t have nuts either and might try pumpkin seeds (pepitas)! I used the raisin water to sweeten my tea. The kids gobbled these up the one time I made it, and I’d love to be able to offer them this rather than other less healthy options when they get a sweet tooth. I promise these won’t burn your food processor up! :) This one is great because you can scrape the sides without stopping the processor. I hope you get to try them! any suggestions for a nut-free version? Sounds amazing! I’ll make sure to give it a try! Yay! They’re such a great snack. Can you suggest alternative to cashews for this recipe? Pecans, pistachios or almonds? Hi! Any nut should do, though you may need to adjust the amount to get the right texture. Almonds or pecans sound delicious!